Moopoo | SharePoint and life. It’s been interesting being a Mac user over the last couple of years. We’ve gone from being very much left behind compared to our fellow Windows users to pretty much feature parity. Well that’s what the marketeers would have us believe, in reality my experience is very different. Yes we’ve got more functionality than we have ever had but while the new Microsoft is moving at a breakneck pace in the Office and Office 365 arena, we starting to get left behind again. This post describes the woes I have at this present moment with the various Microsoft apps that I use on my Mac. You might have your own problems and I’d be interested to hear about these. Just to balance this out I will also give the pros from my point of view, over what we had before, just so the post isn’t all negative. This isn’t a review of the products though, I don’t use any of them enough to be an expert or give an expert opinion on all the features. Firstly to set the scene, I’m using Office 2016 installed from my Office 365 subscription on my late 2015 Macbook Pro armed with a core i7, 16GB RAM and 500GB SSD. Add-ins: These are a great addition. I use Trello on a daily basis to bump my emails into my boards for further action. The same add-in also allows me to do this from Outlook on my phone without me having to install it specifically on there. Hmm that’s about it, it handles my Office 365 and Outlook.com accounts fine. Schedule Skype for Business meeting: Not sure where the blame lies for this but I simple cannot find a way to add a meeting to Outlook and make this an online meeting. In Outlook on Windows, you have a Skype Meeting button which adds all the connection details to it. There is no such button in Outlook on my Mac. Update: I found a post on the Skype feedback forums that this feature has been added but from reading the comments it appears you have to have Lync installed too. Crazy!! At he moment for me, this is pretty much unusable for me. Most (all) of my contacts are external to my tenant and I’ve had success in adding one from another tenant but that’s it. Join a meeting. I can join a Skype meeting hosting by someone else. Add a contact: This is greyed out for me so I have no way of doing that. Hosting a meeting: This was a pro right? Yes but in a meeting, I cannot invite anyone else who is not an Office 365 user or in my tenant. I tried with a colleague who has a Hotmail address and we both expected him to receive an invite so he could join via Skype on the web. He didn’t get the invite. Schedule a meeting: Skype for Business very proudly shows my Exchange calendar but I can’t actually do anything with it. In fairness to Microsoft, this has got better since it’s first release if you can believe that. This is probably the application that has had the most fanfare over the last 12 months and has come along way over the previous versions but it’s falling behind again. Multiple accounts: No longer do I have to install two OneDrive applications; one for my OneDrive for Business and another for OneDrive personal. I can login to both from one app. Shared folders: This is a great addition, I can now select a folder that is shared with me and sync that down. Install on an external drive: The latest Macbook Pros offer no way to to update the internal SSD, which isn’t MS’s fault I know but.. There are micro usb drives or micro SD adapters that sit flush with the casing, these are great ways of bumping files storage but OneDrive won’t let you store your files on here. No pause: It would be nice to be able to pause syncing for a while, while tethering to a phone for example. Currently I use TripMode to deny access whilst connected to my phone. That works great but would be nice to have an out-of-the-box experience for it, especially if it offered scheduled sync times. The lack of the first two options above has led me to have to turn off sync for certain folders, and this list is growing. At some point it won’t actually be worth me using OneDrive as I won’t have any space to sync anything down. The first two OneDrive cons I have listed have suggestions on UserVoice, please vote if you would like to see these added to future versions. Just to put a bit of context to the pros and cons for OneDrive above. This is primarily for my personal account (outlook.com), not business. These are not files that have metadata attached to them. They’re my personal photos, videos and documents. I’ve spent years preaching about the benefits of metadata to customers and this isn’t me not practising what I preach. I do that on my business files, on my personal stuff I don’t have the will (or time) to go back through files built up over the years. I don’t think it’s acceptable to have to install another (legacy) application (Lync) to get some of this functionality working, in fact Microsoft don’t support them running side by side so it seems people may have got them working more out of luck than anything else. We’re more than half way through 2017, Skype for Business has been GA for nearly 9 months now, it’s to get this working properly. Don’t get me wrong Microsoft are doing some great things, especially in the spaces that I work but it would be nice for them to stop and have a look around once in a while, tidying up after themselves before moving on. I’d like to hear of your issues or more so if there are ways to get some of the things above working. Or maybe I’m just doing some things wrong. There are probably easier ways of some of these tasks but due to time constraints and server configuration, this is the way that worked for me.We are using TFS 2015 so your mileage on VSTS may vary, I haven’t tried these on there yet.Pre-requisitesThe post will not teach you how to build a custom build task. What I’m focusing on is Step 3 from the last link below. Below are the posts I used as reference when creating mine. One thing to note about this task is that part of the path contains the TFS service account. This is because the NPM install above doesn’t actually install the package globally, it installs it in the user directory. There are ways to change/get around this but I’m happy for now as this does what I need it to and the service account is very unlikely to change. I tried to find a variable for this to save me hard coding it but couldn’t find one.The –output-path parameter below puts the vsix in a subfolder to keep things nice and neat.Change sharepoint-extensions.json to whatever your extension manifest file is. The final task (for me anyway) is to copy r extension vsix file onto a network share to be installed. The logical next step is to create a release or build task that will automatically deploy it to TFS (or VSTS). Unfortunately that’s not part of my remit here and I don’t have access to the TFS server to configure IIS for it. So for now we are manually installing the extensions into TFS. Ok, I think two firsts happened here, or are happening. First is that I made my first Pull Request to an Open Source project and second is that I think this is the first blog post about my thoughts on doing something, rather than it being a technical post. Submitting the PR was a lot more of a daunting thing than I expected. What if I get flamed, what if the PR is rejected, would that make me try again or put it down to experience and not bother in future. The post, I’m even less sure about; yes everyone has an opinion and we voice these everyday but to actually put these in black and white on the internet where they are pretty much available to everyone to scrutinise for eternity, that was food for thought. I know that as in normal life, not everyone agrees with my opinion, that helped me to get to grips with the fact the same thing applies online. Well I’m glad to say the pull request made it in through, the fix makes my life easier so why shouldn’t it make the life of someone else easier too. If you’re interested the project is here. Anyway, I’ve done it, I feel better for it and shall move on and do some more of both along with the more technical posts too. I’d love to hear about your experiences of first doing something like this. I originally wrote this post pretty much a year ago but never quite finished it, then forgot about it. I was thinking about not bothering to publish it but thought I might as well get it out there. Thinking about it, it’s probably not my first. I heavily used a PHP framework back in the day that I customised quite a bit, but I’m taking this one. On one of the projects I’ve been working on recently I needed to test against one of the API’s in the organisation. Adding my dev server to the list of allowed CORS URL’s for the API wasn’t possible but I didn’t want to pull down the code, deploy and in particular populate the database so I could test something pretty trivial. Turns out you can run Chrome so that it will ignore CORS headers and allow you to access the API anyway. I wouldn’t advocate this for day to day use and may get you into trouble if you’re hitting an API you’re not supposed to but, here you go, simply run this. This is the second post in this series and the post will pick up where we left off. We are going to configure Visual Studio Team Services and create the build tasks that will deploy our files into our Azure Web App using the gulp tasks we created previously. This will run automatically when we check in to source control. Login to your Visual Studio Team services account and navigate to your chosen project in VSTS and click the settings icon to the right of the screen. Note: I probably should have used (and tried) Azure Resource Manager as it’s the new kid on the block but this did not work for me when I got to the stage of adding the build task. I may revisit this but for now this was about me getting this working and deployed. Now we need to get the rest of the settings. To do this we need to download the publishing profile from our Azure subscription. To get this click the download publish settings file link at the bottom of the screen above. Once you have this enter these details in the corresponding boxes above. 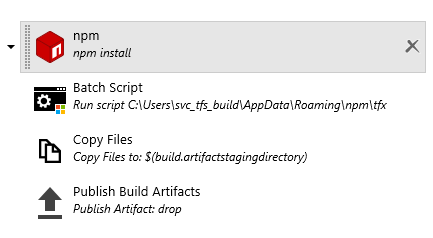 You can call the connection name anything you like, remember it as we will need it when we create our build tasks. Click OK when this is done. Just in case you’re interested you can download your publishing profile from here. Now we can add a build definition to deploy our site to Azure. Click OK when you’re done and you should end up with a screen similar to that below. Ok, lets configure each of the build tasks. npm install is easy, we can leave the defaults on this. To configure the gulp task we need to use the following values, taken from the previous post. Azure Subscription: Enter the Connection Name from way back when we created our Service Endpoint above. Web App Name: This is the name of our existing Web App in Azure we want to deploy to. You can get this from the App Services blade in the (new) Azure Portal. Web App Location: Enter the same location as for the Web App we are deploying to. I left everything else blank. One point to note on this screen the first 3 boxes are dropdown and should show the Subscriptions, Web Apps and Locations respectively. This wasn’t the case for me and I had to manually add them. It all worked for me, just be careful to add the correct values if it doesn’t allow you to choose them. Hit the Save button and everything should be good to go. Next step is to trigger our builds. To do this click on the Triggers link. Check the box for Continuous Integration (CI) and make sure the correct branch is selected. All that’s left to do is check in code into the correct branch and this should fire a build for us and deploy to Azure. Once you check the code in, you should see a build queued and you can follow it through until completion. In the next post I will show how you can configure the gulp build task to build some AngularJS constants that are specific to the environment we are deploying to.